Bonhams is delighted to announce that it will be selling at auction the contents of the world-famous Den Hartogh Museum, The Netherlands, on 23 June 2018. An exclusive press preview day will take place on 14 June. In addition to the 49 motorcycles to be offered entirely without reserve, it is believed to be the largest collection of Fords in the world and demonstrates the true breadth and variety of the American marque. Examples range from Ford Models A, B and C to ice cream vans, ambulances and fire engines. The all-day sale will take place at the Den Hartogh museum in Hillegom, just outside Amsterdam. 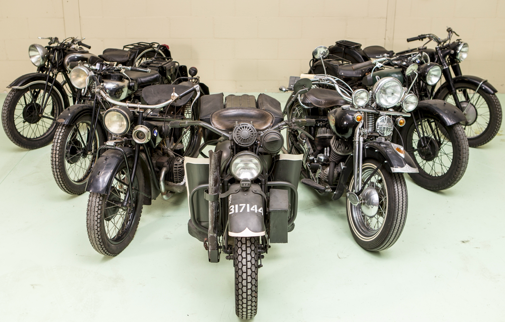 Highlights of the motorcycle sale include a brace of military machines – c.1943 Harley-Davidson 750cc WLA and c.1947 Moto Guzzi 498cc Superalce Military; an array of BMW’s including a Vintage 1928 BMW 482cc R52 and a 1958 BMW 490cc R50/Steib Combination together with a flurry of important British machines including the 1936 Ariel 600CC Square Four 4F/6 and 1931 Ariel 557CC SB31 Sloper.